Mark your calendars — on October 9th, the next major festival hits Valencia, the Day of the Valencian Community (Día de la Comunidad Valenciana). Preceding the official events of the 9th, the city invites pyrotechnic artists from all over the world to put on a massive fireworks display in the riverbed of the Turia on the evening of October 8th. On October 9th, 1238, King James I of Aragon entered Valencia and liberated it from 500 years of Moorish rule. 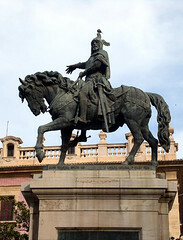 He created an autonomous country, the Kingdom of Valencia, and has become the city’s most cherished historical figure. The Day of the Valencian Community, October 9th, is one of the region’s most important holidays. The 9th is the day of official festivities, beginning with the lowering of La Senyera from the Ayuntamiento. 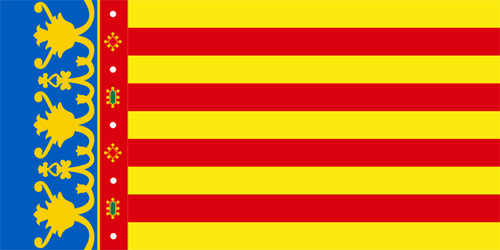 La Senyera is the official flag of the Valencian Community, and is lowered from its usual place on the city hall to street level, instead of being brought through the doors, because — according to royal proclamation — the flag may bow to no one. Don’t act as though you’re surprised. The rest of the day is filled with traditional music and dancing in the Plaza de la Virgen, as well as a procession of Moors & Christians throughout the old city. October 9th also happens to be the day of St. Dionisios, who Valencians revere as the saint of love. So, young Valencians in love traditionally present the object of their affection with a Mocaorà, which is a handkerchief filled with sweets. There might well be other events worth seeing as part of the celebrations. This is our first time, so if there is something else worth watching out for, any information we’ve gotten incorrect, or an interesting piece of trivia we’ve neglected, please leave a comment! The procession of Moros and Cristianos goes on all day. The parade goes up Paz down Vincente Martir to the Ayuntamiento. It lasts 6 or 7 hours. The first year we watched a bit, went home for a nap, went out to eat and then went back to watch some more. Of course it ended in a Mascleta too. To me the marchers are like New Orleans Mardi Gras crews. Each group has their Moors and Christians. Some are authentically dressed, others have gotten so elaborate they are like Zena on crack. Many do not even try to be remotely related to the event it commemorates the Moors marching out and Jaime and his army marching in to retake Valencia. The blackface can be off putting to North Americans. In 2006 they sent a large group to NY to march down 5th Avenue on the 9th, for publicity for Valencia and the America’s Cup. Right as they were set to go someone noticed the “Moros” had put makeup on to darken their skin. The publicists panicked and only let the Cristianos march. It is the 2nd biggest and best (or worse) Fiesta here.